Erv influenced many singers in New York and throughout the country. Most recently, he was the Executive Artistic Director of the Cabaret Conference at Yale. (Many local singers have trained at the Cabaret Conference or the Cabaret training sessions held at the Eugene O’Neill Theatre, where Erv served as Co-Director.) Erv was also instrumental in the start-up of the DC Cabaret Network and served on the Advisory Board. 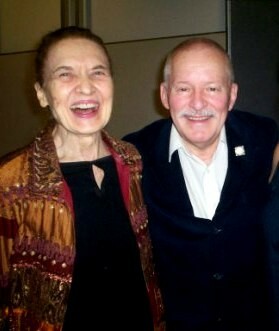 Steven Cupo talked about Erv’s contributions to cabaret as a club owner and manager in New York in the 1970’s, and stated unequivocally that “there would have been no cabaret in New York as we know it today without Erv.” Beverly Cosham talked about knowing Erv and performing in his clubs during that time. Terri Allen brought a photo of Erv and George Fulginiti-Shakar had magically found purple boas in a garbage bag near his house, (yes, this is true), that adorned the music stand. Performers wore the boas as the mood struck them. As several people spoke, references to singers came up and the audience was introduced to important icons like Nancy Lamott and Karen Mason who began their careers as singers in New York as Erv launched his clubs. With George Fulginiti-Shakar at the keyboards and Jeff Tucker, Art of Music, on sound, it was a memorable evening for the DC Cabaret Network. Although Erv began his career in New York as a club owner, he believed it was important that singers have the opportunity to work on their craft with other great performers and musicians, and that is why he worked with the two Cabaret Conferences.